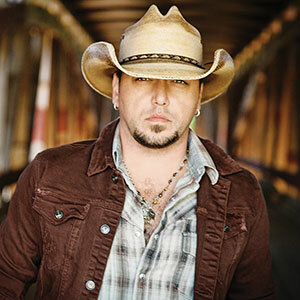 The singer Jason Aldean is the musical powerhouse who has had multiple hits since his debut in 2005. Almost 15 years later, and with a net worth of 80 million dollars, we would say that the 42-year-old is doing pretty well for himself now. You would never know that the guy selling out stadiums was once a 14-year-old singing in a bar. That doesn’t mean he never sings in bars anymore, to this day, he likes to perform karaoke with friends in his hometown. Aldean was born in Macon, Georgia as Jason Aldine Williams. At a young age, his parents divorced, and he continued to live with his mom and sister, Kasi, from there on out, spending summers with his father. He played basketball at Windsor Academy, where he was scouted by potential colleges. When he graduated high school, he decided that he would like to pursue a music career instead of furthering his education. The singer’s albums have been world renowned from the beginning of his career. In 2005, Jason came out with his self-titled debut album where he pulled through with a number one song for his first single, Hicktown. Then in 2007 he released Relentless. After that he had subsequent hit albums Wide Open, My Kinda Party where his biggest hit Dirt Road Anthem was featured, Night Train, Old Boots, New Dirt, They Don’t Know, and Rearview Town. Most of Jason Aldean’s albums have scored number one spots on the charts, if not, in the top ten. One of the things that you may not know about Jason Aldean, is that he owns a bar in Nashville. The bar opened in 2018 and has shown a promising future. Though Jason seems to be having a very successful career, his personal life wasn’t always so rosy. Jason was married to his high school sweetheart, Jessica, but in 2013 they ended their marriage due to infidelity on Jason’s part. Jason’s ex-wife Jessica is the mother of two of his children, Keeley and Kendyl. Only two years later, Jason and the woman he cheated on Jessica with, Brittany Kerr- who was a contestant on American Idol, were in the midst of a wedding. The 30-year-old is much younger than Jason, but the two have added a baby boy, Memphis Aldean, to their family, and soon they will welcome another little bundle of joy, a girl! It’s been such a joy to watch Jason’s family grow, you can tell what an incredible father he is by the glow on his children’s faces. His children bring joy to their father as well, but so do his vast number of awards. From Academy of Country Music Awards to Billboard Music Awards, Jason has an array of trophies to add to the shelves of his home. Maybe one day he will get to win that coveted Grammy, the one award that seems to escape him. We are sure it will happen for him one day, and when it does, we will be right here cheering him on!